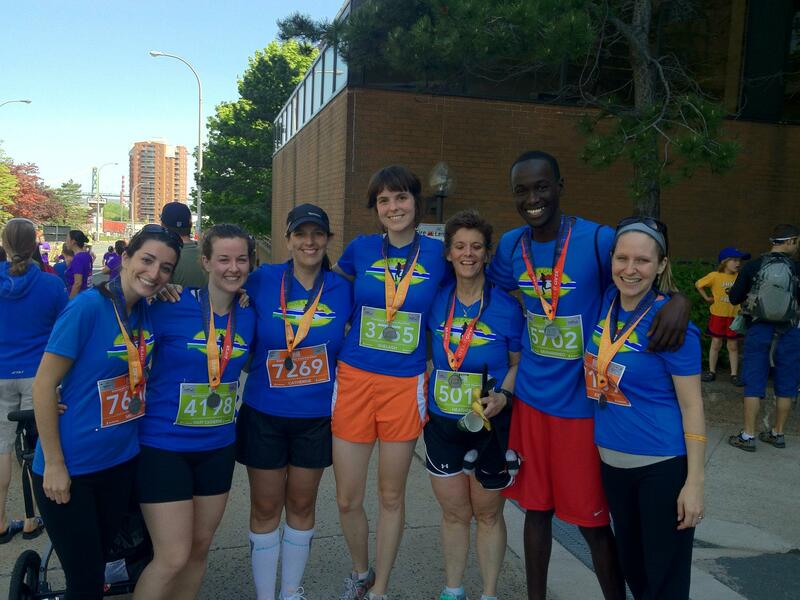 Last Sunday was race day for members of Team Love4Gambia’s Blue Nose contingent! What a spectacular weekend it was! For the first time in Blue Nose history, runners and walkers were greeted with wall-to-wall sunshine and warm temperatures on race morning and throughout the weekend. Marc and I had arrived in Halifax on Friday night and spent Saturday at the race expo catching up with many Halifax friends, including the great gang at Aerobics First. We also visited a number of people around town and had plans to hook up with many more, but the day proved to be far too short to pack everything in we wanted to do. Apologies to those we didn’t see – we’ll have to be back for a longer stay soon! We did manage to drop by the Nova Scotia – Gambia Association’s offices to connect with Muhammed and Kelly, and we also got to visit with Erin to meet baby Regan and to get a few more tips for running across the Gambia. 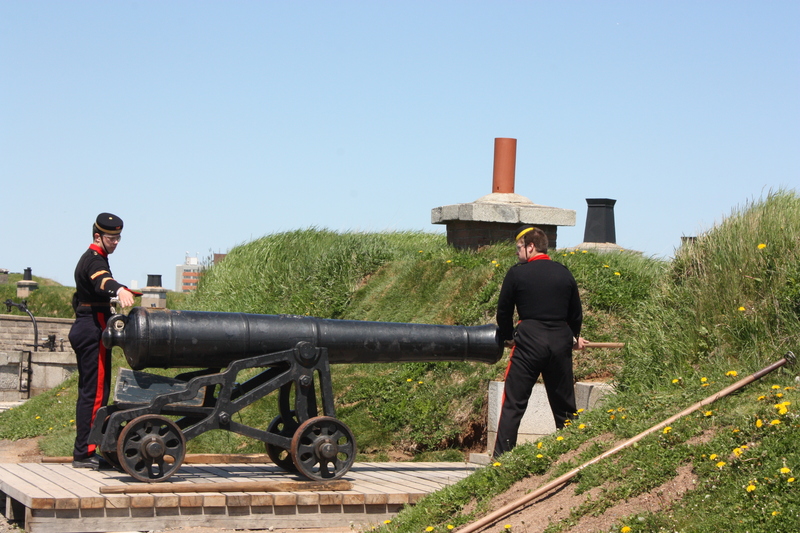 And we spent an hour playing tourists and visited the Halifax Citadel where we watched the traditional firing of the noon gun cannon – all in all an action-packed day! On race morning, we headed to the start early with our friend Megret who was running her first 5 kilometer race. The great weather brought spectators out in droves and there was a festive atmosphere at the start line. At 8:00 a.m. sharp, one of the Citadel’s 78th Highlanders fired of his musket to signal the start of the full marathon. I was off! The 5 km, 10 km and half marathons started in quick succession after the marathoners were sent off. Numerous spectators supported runners and walkers along the course with the typical Maritime warmth and cheer. All was ticking along nicely and I had a good rhythm and pace going. But I noticed quite early that I was getting very thirsty. I had been hydrating well in my lead up to the event and had also stopped at every water station along the route to take a couple of cups of Gatorade and water. But the stations were spaced too far apart for my liking, especially given the warm weather, and I could feel myself get more and more dehydrated. By kilometre 25 my dry mouth was accompanied by a headache, dizziness and goose bumps – not good! I don’t usually wear hydration packs in road races, as I find there are typically enough aid stations to meet my fluid needs. But as I looked at the other runners around me on the marathon course, I noticed that many of them were carrying fuel belts or hydration packs. They obviously knew something I didn’t. By kilometre 29, I was no longer able to maintain my pace and my friendly chatter, shouts of encouragement to other runners and of thanks to the volunteers, and my egging on the crowd stopped. It was time to just put my head down and to keep moving. Team members showing off their race bling! Up until this point, I had been third woman and had started closing the gap to the second female. But when the wheels came of the wagon, I fell back to fourth and then fifth, the place I maintained to the finish. As I came along Cogswell Street for the final stretch, a volunteer on a bike came along and rode alongside me, cheering me up the last hill to the finish line. And just before getting there, loud and joyful shouts erupted from the left hand side of the finish chute where a bunch of members of Team Love4Gambia, friends as well as volunteers and staff of the Nova Scotia Gambia Association were waiting for my arrival. Thanks for the warm welcome! We then exchanged war stories from our respective races before refueling on yoghurt, bagels, and a latté. Even though it wasn’t quite the running day I had wanted, it was a fun event and a solid training run to get ready for the run across the Gambia. Kudos goes to all the amazing members of our Blue Nose team who surpassed the $10,000 fundraising goal for this race weekend! You are incredible and your support will make a difference in the lives of children in West Africa – thank you! 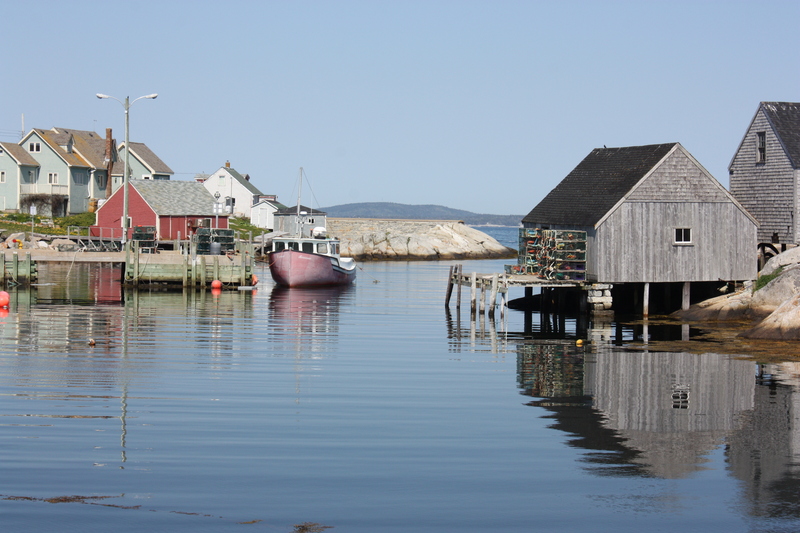 On the holiday Monday, Marc and I played tourist and spent a full day along the South Shore, where we visited Peggy’s Cove, Mahone Bay and Lunenburg. We had a great visit and really enjoyed our time in Nova Scotia. This is now one week later and I just finished putting the timing chip on my shoe and packing my post race bag for tomorrow’s Ottawa Marathon. Looking forward to another great race day and to once again seeing many blue Love4Gambia team shirts out there on the course. Wishing all the members of our Ottawa team a fantastic race weekend! Team members, please remember that you can keep fundraising right up until June 19. 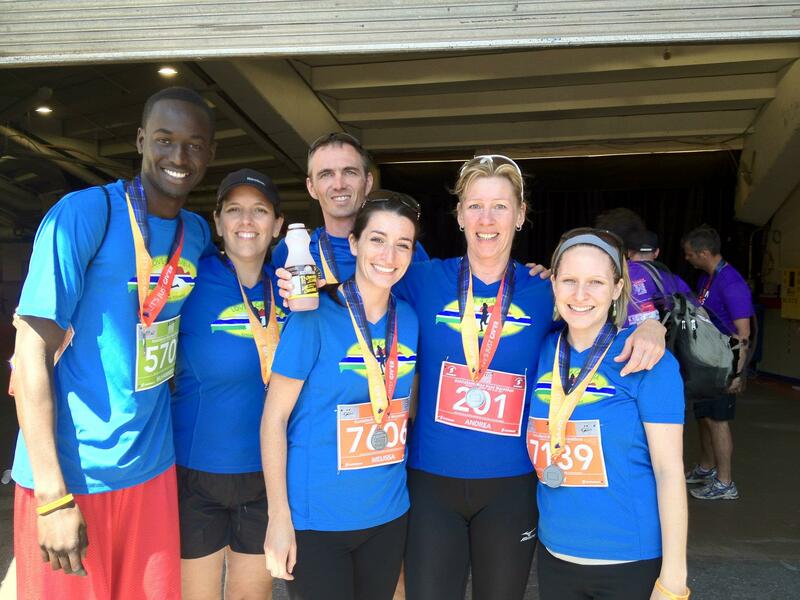 Tell everyone about your great race weekend achievement and ask them to sponsor you! As always, thanks to all for your support. Can’t believe I will begin the run across the Gambia in just one month! This entry was posted in Charity Team and tagged Blue Nose Charity Challenge, Blue Nose Marathon, double marathon, Gambia, Halifax, Ottawa Marathon, Ottawa Race Weekend, race report. Bookmark the permalink.